Following Sotheby’s announcement of the sale of a trio of important and historic diamonds – the Graff Vivid Yellow, the Victory, and Graff round brilliant-cut diamonds – on the occasion of the display of these diamonds at Sotheby’s London, prior to their sale at the Sotheby’s Geneva Magnificent Jewels and Noble Jewels sale, coming up on May 13, 2014, Christie’s Auction House too announced in New York on April 13, 2014, the sale of three important and historic diamonds, when they went on display at New York, prior to their sale at the Christie’s Geneva Magnificent Jewels Sale coming up on May 14th, 2014. The Christie’s famous trio includes the “The Blue,” the “Ocean Dream,” and “The Rajah” diamonds. Christie’s Geneva Magnificent Jewels Sale will undoubtedly be led by “The Blue” diamond, described by jewelry experts as a rare example of “blue perfection,” with a combination of the highest 4Cs a diamond could achieve – highest color-grade of fancy-vivid blue; highest clarity-grade of internally and externally flawless; perfect pear-shaped cut and a relatively high weight of 13.22 carats for a blue diamond, described appropriately by Rahul Kadakia, the Head of Jewelry for Christie’s Americas & Switzerland, as the largest, flawless, vivid blue diamond in the world. The largest fancy vivid blue diamond in the world is the 27.64-carat, heart-shaped “Heart of Eternity” diamond, but its clarity grade is VS2. The 20.17-carat, emerald-cut, “Sam Abram Blue Diamond” is also a fancy vivid blue diamond, but its clarity grade is also VS2. Another perfectly symmetrical pear-shaped, fancy vivid blue diamond weighing 14 carats bears the name “Blue Empress” but its clarity grade is not known. Hence, without any doubt the 13.22-carat, flawless, pear-shaped, fancy vivid blue “The Blue” diamond is the largest flawless vivid blue diamond in the world. The price tag of US$ 21 to US$ 25 million placed on “The Blue” diamond, working out to US$1.59 million to US$1.89 million per carat, is a reasonable estimate for this diamond, given the extreme rarity of blue diamonds in general, whose occurrence in nature is less than 0.1% of all naturally occurring diamonds, coupled with the rare 4Cs of this diamond, enhancing its rarity, that prompted Rahul Kadakia to refer to this blue diamond as “the best blue diamond in the world.” Moreover, the current unprecedented demand for rare and high-quality colored diamonds, driven by several factors such as collector demand; increasingly limited supply; the search for safe havens for investment, especially during periods of economic uncertainty; and the increasing demand from the newly booming economies of China and India, more than justifies the estimated price for this extremely rare diamond. 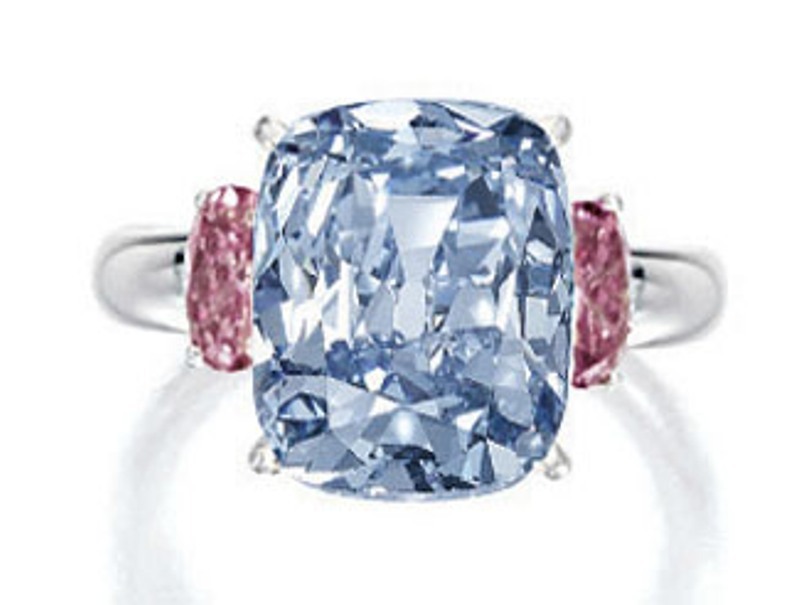 1) 10.95-carat, triangular-cut, fancy vivid blue, Bulgari Blue diamond that sold for US$15.7 million at Christie’s New York in October 2010, equivalent to US$1,433,790 per carat. 2) 6.04-carat, emerald-cut, fancy vivid blue, unnamed blue diamond, purchased by Moussaieff Jewelers at Sotheby’s Hong Kong auction in October 2007 for US$7.98 million, equivalent to US$1,321,192 per carat. 4) 5.96-carat, pear-shaped modified brilliant, fancy vivid blue diamond that sold at Sotheby’s Geneva in November 2009 for US$7.5 million, equivalent to US$1,258,389 per carat. 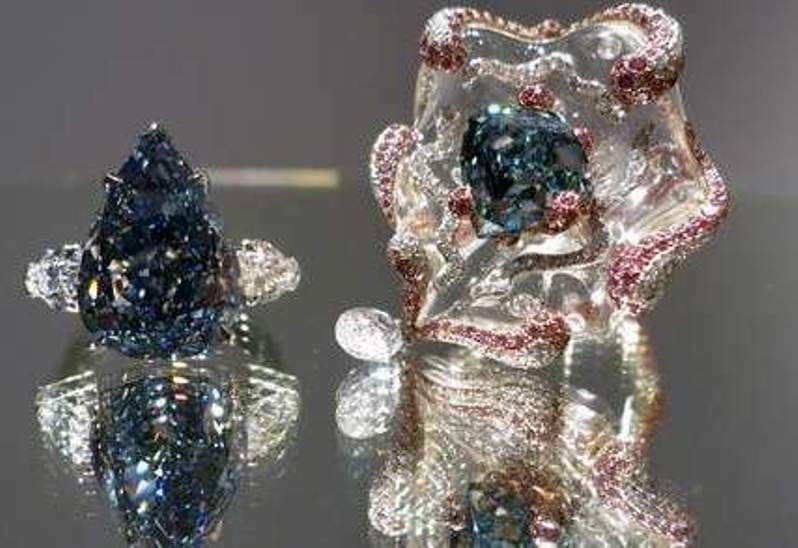 5) 5.16-carat, pear-shaped, fancy vivid blue, internally flawless De Beers Millennium Blue diamond that sold for US$6.4 million at Sotheby’s Hong Kong in April 2010, equivalent to US$1,240,310 per carat. 6) 4.16-carat, pear-shaped, fancy vivid blue diamond that sold for US$4.7 million at Sotheby’s Geneva in November 2007, equivalent to US$1,129,808 per carat. 7) 3.73-carat, pear-shaped, fancy vivid blue diamond that sold at Sotheby’s Geneva in May 2008 for US$4.96 million, equivalent to US$1,329,759 per carat. 8) 3.25-carat, square emerald-cut, fancy vivid blue, internally flawless diamond purchased by Aleks Paul of Essex Global Trading for US$3.6 million at Christie’s New York in April 2011, equivalent to US$1,107,692 per carat. 9) 3.18-carat, marquise-cut, fancy vivid blue, internally flawless diamond that sold for US$3.27 million at Sotheby’s New York in April 2011, equivalent to US$1,028,302 per carat. 10) 8.01-carat, emerald-cut, fancy vivid blue diamond that sold for US$12.72 million at Sotheby’s Magnificent Jewels & Jadeite sale at Hong Kong on April 03, 2012, equivalent to US$1,588,015 per carat. A study of the above figures show that the price-per-carat of the ten fancy vivid blue diamonds considered, vary between US$1.03 million and US$1.68 million, irrespective of the cut or clarity grades of the diamonds. Hence, the price-per-carat of fancy vivid blue diamonds irrespective of the cut or clarity grades is over one million dollars. 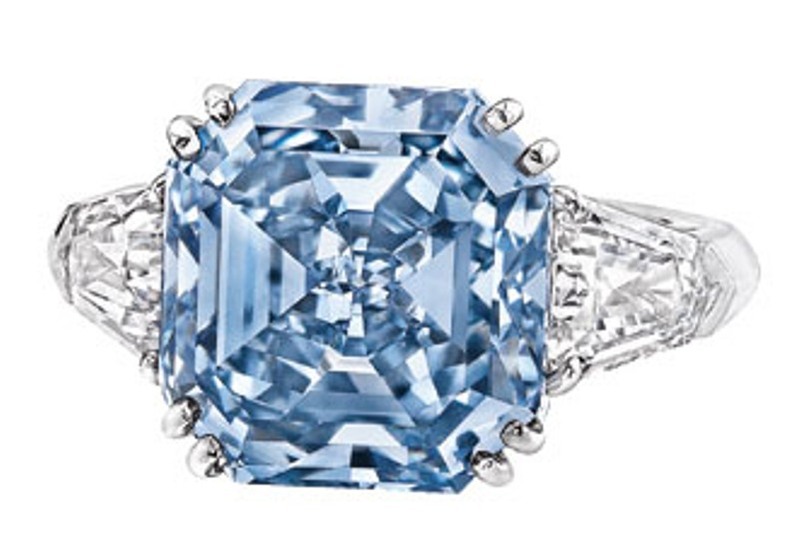 The highest price-per-carat of US$1.68 million was achieved by a 6.01-carat, cushion-cut, fancy vivid blue diamond, followed by US$1.59 million achieved by the 8.01-carat, emerald-cut, fancy vivid blue diamond, and then US$1.43 million achieved by the 10.95-carat, triangular-cut, fancy vivid blue “Bulgari Blue diamond,” and US$1.33 million achieved by a 3.73-carat, pear-shaped, fancy vivid blue diamond, and US$1.32 million achieved by a 6.04-carat, emerald-cut, fancy vivid blue diamond. Next highest of US$1.26 million and US$1.24 million was achieved respectively by fancy vivid blue diamonds weighing 5.96 and 5.16 carats. US$1.13 million, US$1.11 million and US$1.03 million were respectively achieved by fancy vivid blue diamonds weighing 4.16 carats, 3.25 carats and 3.18 carats. Hence, there seems to be a broad correlation between price-per-carat and the size of the blue diamonds in terms of their carat weights. In other words bigger the carat weight of the fancy vivid blue diamond, higher the price-per-carat achieved by the diamond. Accordingly, given the fact that a 6.01-carat, cushion-cut, fancy vivid blue diamond sold for US$10.1 million or US$1.68 million per carat, the price tag of US$21 – US$25 million or US$1.59 million to US$1.89 million per carat for “The Blue” diamond with a weight of 13.22 carats, (more than double the weight of 6.01 carats) is perfectly justified. By all indications it is certain that the world record for price-per-carat for a fancy vivid blue diamond of US$1.68 million held by the 6.01-carat, cushion-cut, fancy vivid blue diamond sold at Sotheby’s Hong Kong in October 2011, will be broken by the 13.22-carat, flawless, pear-shaped fancy vivid blue “The Blue” diamond, when it comes up for auction at Christie’s Geneva on May 14th, 2014. The next important diamond that comes up for auction at Christie’s Geneva on the same day is the 5.50-carat, trillion-cut, fancy vivid blue-green diamond known as the Ocean Dream, the largest of its kind in the world, the subject of a dedicated webpage in our website. Please click here for this webpage. 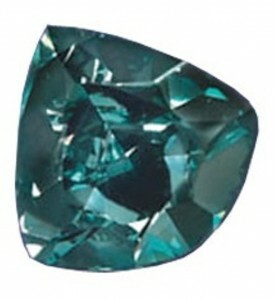 Blue-green color is a much sought after color in diamonds, that rarely comes up on the auction block. Hence, the pre-sale estimate of US$7.5-9.5 million placed on this extremely rare diamond will most likely be exceeded when it comes up on the auction block at Christie’s Geneva on May 14th, 2014. The Cora Diamond Corporation of New York were the owners of the “Ocean Dream” diamond, which was given on loan to the National Museum of Natural History of the Smithsonian Institution, in the year 2003, where it was displayed as part of the “Splendor of Diamonds” exhibition, held between June 27th and September 30th, 2003, alongside the De Beers Millennium Star, the Heart of Eternity, the Moussaieff Red, the Alnatt, the Pumpkin, and the Steinmetz Pink diamonds. The third important diamond due to come up for auction at the same Christie’s Geneva sale, is a historic diamond known as the Rajah diamond, that probably originated in India and was purchased by Tiffany & Co. in the 19th-Century. Tiffany’s sold the diamond to Isabella Stewart Gardner. The diamond went under the hammer at Christie’s once before in 1997 and is now back at auction. A pre-sale estimate of US$3-5 million is placed on the diamond, which is likely to be exceeded given the historical provenance of the diamond.